The movie takes a look at one doctor who is credited for having found that serious conditions may arise in professional football players who suffer from repetitive head trauma. It’s frustrating to see the science behind it and fully understand the dangers, and without spoiling the movie, if you follow football, you already know the extensive amount of precautions that are now taken to prevent such injuries. However, this tremendous picture highlights one man’s journey to reveal the truth to the public. Dr. Bennet Omalu, a Nigerian neurologist who handles autopsies, is called on to determine the cause of death of famous football player Mike Webster. Omalu, through his autopsy work finds out that Webster suffered from severe brain damage and through further research concludes that multiple concussions had caused Webster to exhibit extremely unusual and erratic behavior, a leading cause to his death. The sheer danger of this brain damage (CTE as he calls it) leads Omalu to go on a mission to get the NFL to address the problem that only continues to worsen throughout the film. Overall, this was a solid picture that was really well directed. It was extremely scary to see what a couple of concussions could possibly do to an individual and thanks to this film I now see what really may have happened to wrestler Chris Benoit back in 2008. After suffering from so much trauma, these deceased athletes had become a shell of the men they once were and ultimately killed them in the end. Will Smith was exceptional as Bennet Omalu conveying a raw passion and determination to end these injustices against men that the public holds in such high regards. He also perfectly displayed the disconnect that Omalu had from social norms and convinced me that he was well deserving of his golden globe nomination. Albert Brooks was really good here as well as Alec Baldwin. They both did their part in informing the seriousness that Omalu was getting himself into. Smith, Brooks and Baldwin had a particularly great scene together that showed just how much they each have grown as actors over the years. It’s also in part thanks to the fine writing from the script. I also want to point out that Gugu Mbatha Raw did a great job of bringing out another side of Omalu. As a man who was desperately trying to connect more with the living world, Prema Mutiso (Raw) was able to reach out and do exactly that for him. Director Peter Landsmen really did a great job of giving us the breakdown and explain the neurological analysis of concussions. It’s funny how of all people a guy who doesn’t even watch TV came across a monumental health scare for individuals in sports and every other walk of life. Landsmen really showed us that through this incredible story that really happened by chance for Omalu. Thank god in the end his work paid off. So in conclusion, “Concussion” is an important film for all athletes, but even doctors as well. Bennet Omalu is certainly a name that will be written in history, especially for football. 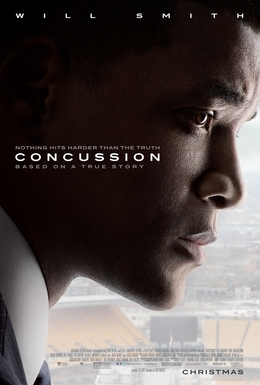 “Concussion” is a superb film that you all must see.